Hey Hasbro: way to get your toys into stores in a timely manner. An ally to justice, Captain America charges into battle with his shield at the ready. Hasbro has gotten very skilled at making us buy the same thing over and over. 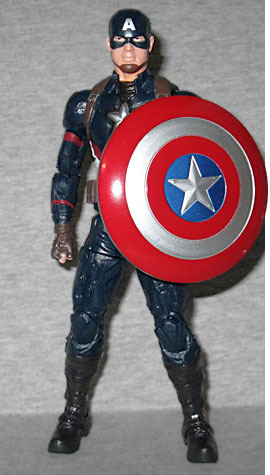 This Captain America toy uses the exact same mold as the Avengers 2: The Streets Captain America toy, which means it also uses most of the same mold as Captain America 2 Stealth Suit toy. If you look at images of the movie suit, you'll see that the shapes really aren't quite right - the panels on his collarbones should be higher and straight across, the smooth areas on the shoulders should turn upward instead of turning sideways to reach the chest, there should be straight seams down the front of his thighs, and the shapes on his forearms are completely incorrect - but most of those flaws are hidden thanks to the suit's new, darker color. If you want a truly screen-accurate representation, this isn't it, but it's definitely a "close enough" situation. Apparently budgets are getting tight again, because the figure only comes with one head. Now, granted, the unmasked heads included with the last two uses of this mold didn't actually look very much like Chris Pratt Pine Hemsworth Evans, so it's not a huge loss, but when Marvel Legends' claim to fame of late has been "extra pieces," stepping back from that can't go unnoticed. The articulation is unchanged. 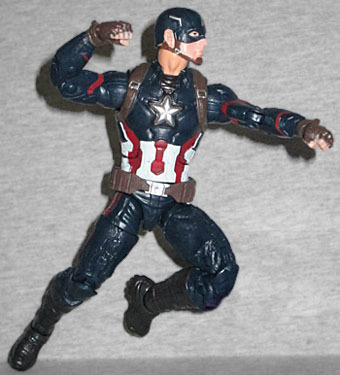 Cap has a balljointed head; hinged neck, elbows, torso, and knees; swivel/hinge shoulders, wrists, hips, and ankles; and swivel biceps, waist, thighs, and boots. Everything moves well, but the odds are you already bought this figure twice before and so you know all that. His colors are dark - even darker than they were on the stealth suit - but that's how they were in the movie as well. Since this mold is being forced to stand in for a costume that had different shapes, most of the red on his limbs is just painted in an approximation of where it would go, with no underlying sculpt to support it. In other words, check the paint before you buy. The extra head isn't the only accessory that's been lost along the way: he also don't come with any extra hands. That's correct, the only hands he has are the fists you'll see in the tray. There's no salute and no pointing finger. 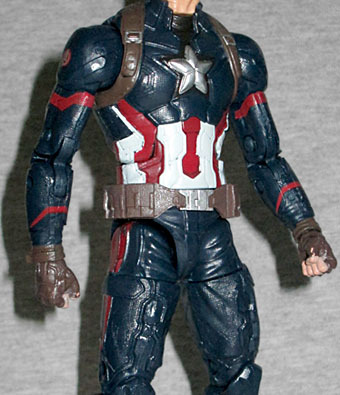 Obviously the ones from the previous sets will fit this one's arms, but what about fans who are buying this as their first Movie Cap? All they'll get is the usual shield. Well, the usual shield and a build-a-figure piece. 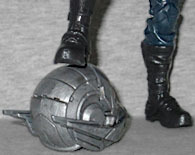 Cap gets the head of Giant-Man, which will surely look very nice once we have a body to attach it to. We've had to wait and wait for this figure to finally be released, and now that it is, it's not that impressive. It's a reused sculpt with no new pieces, and in fact comes with fewer pieces than it used to! The colors are nice, but if all you're interested in is Cap himself, you'll probably be able to pick one up pretty cheap from someone looking to unload theirs sans BAF piece. And if you're not, he shouldn't be too hard to find (eventually), since there are twice as many of him as everybody else.